You are here: HomenextPeoplenextBusinessesnextHarvey's of Wickford. 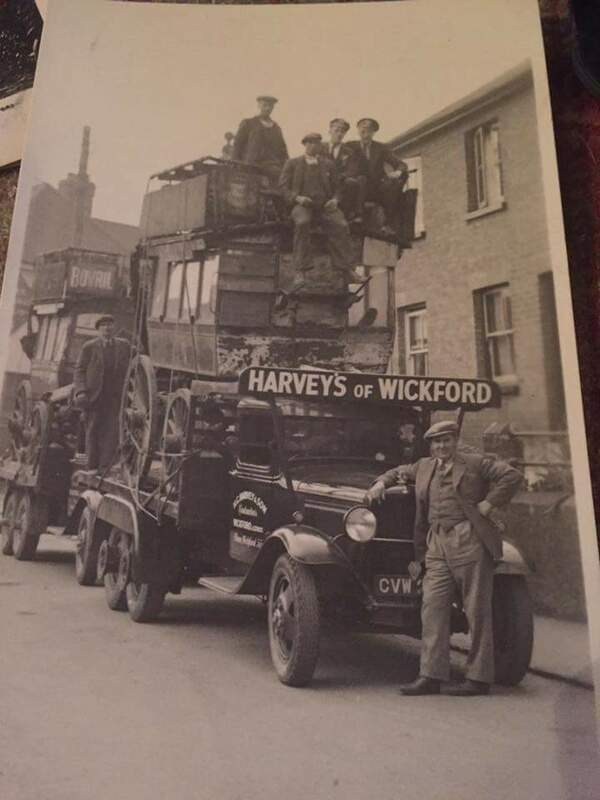 Harvey’s of Wickford lorries parked up by Elm Road. Can anyone think what they were transporting? Can anyone identify the people in the picture? Looking at this a second time, it looks as though they have old charabancs (old coaches) on board. Look overloaded, plus they would not have got under the railway bridge, then or even now. Ah well, those were the days. I remember Harveys, they carried everything. I remember one of their lorries having to stop at the railway bridge to unload the top tier of bales of straw, drive under bridge, then reload the straw and then secure load and drive off. Can you imagine that today? They were taken over by British Road Services when nationalised. I can’t remember what year.